Micromax Ninja A72 gave a start to the cheapest possible 5-inch Android smartphones and then Umi with their Umi XE5 made it to the cheapest by pricing it below Ninja A72, then Spice Smart Flo also joined the league and now it seems that Karbonn is also in the line and it will not be a surprise if we reported about same phone from Lava in coming days. So, Karbonn has named their device as A25 and this is also very much similar to the other phones mentioned above in terms of hardware, let us take on hardware parameters. 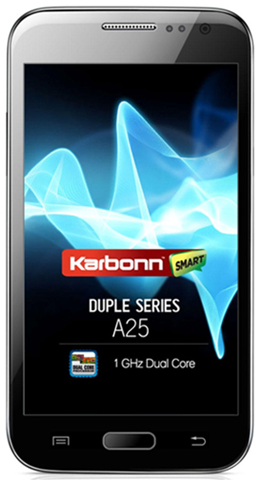 When we consider UMi XE5 then it has got almost all the hardware parameters which Micromax Ninja A72 has but it has been priced below it by the margin of 2000 INR and when we consider the other phones like Spice Smart Flo and this Karbonn A25 they are priced at the level of Micromax Ninja A72 but they have better spec that Ninja A72. For Example, Smart Flo and Karbonn A25 have 512 MB RAM whereas in case of Umi XE5 and Micromax Ninja A72 they have got 256 MB RAM. Again the camera specifications of all the phones match each other with 5MP primary camera and a VGA camera in front as the secondary camera. The processor used in all the phone is also same which is 1GHz Dual Core Processor though the make of the processor vary in all the phones. As the likes of Spice Smart Flo this also does not provide the 3G support in both the SIM Slots and its internal memory capacity is 512 MB which can be extended up to 32GB (in case of Umi XE5 it can be extended up to 16GB). It will operate of Icecream Sanwich and has the display resolution of 480 x 800 pixels (WVGA display). The battery strength is better than Micromax Ninja A72 which is 2000 mAh and in all this phone is a better option when compared with Micromax Canvas A72 and gives a good fight to Spice Smart Flo 2. This phone is available on Infibeam and Saholic at the price of 6,590 INR. its is good phone not the best, you have so many other options as well in this price range from other brands. We cant take any responsibility if you face any problem with the device.